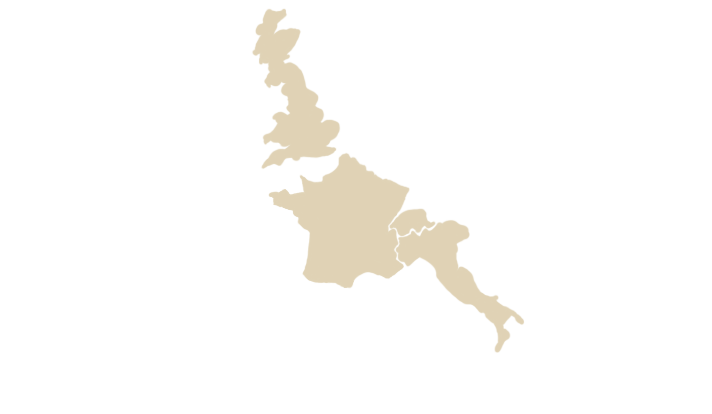 Puglia is known as the area that feeds the rest of Italy. 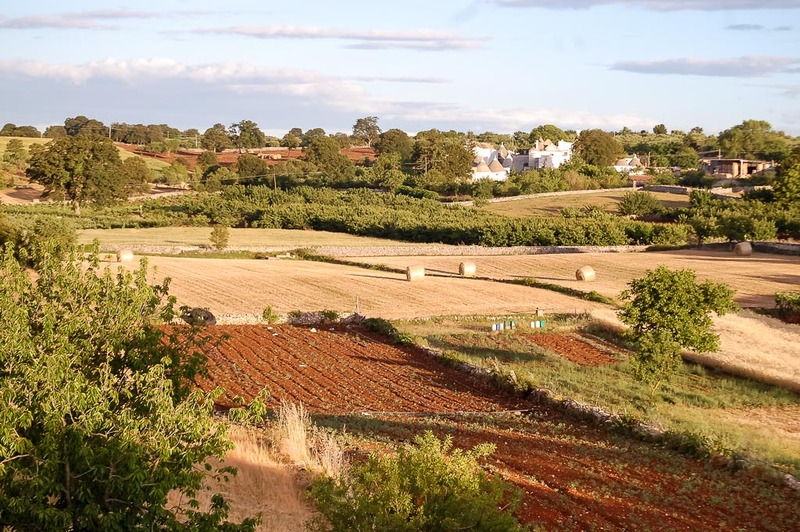 The glorious countryside has rolling hills covered with vineyards, olive groves and fields laden with fresh fruit orchards. In between there are medieval hillside towns and villages like Tuscany, but often with more dramatic architecture of pure white stone. 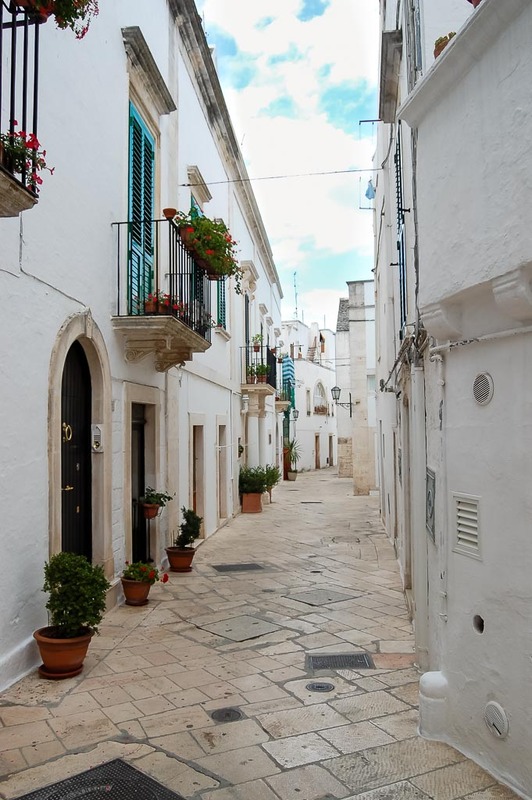 Ostuni is know as “The White City”. There are churches and cathedrals, but also endless miles of beaches and seaside. The largest underground caves in Europe, a famous safari park and water parks will keep the children happy. Food and drink from the local produce are always fresh, highest quality, and much cheaper than other parts of Italy. The cuisine, like the culture and the architecture, is unique to Puglia. 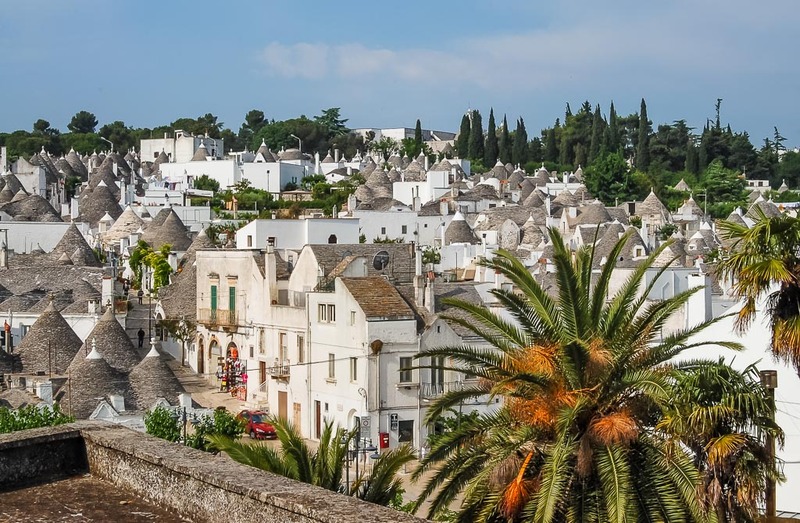 The trulli of Alberobello are a World Heritage site. These exist nowhere else in the world, and there are thought to be less than 5000 of them. 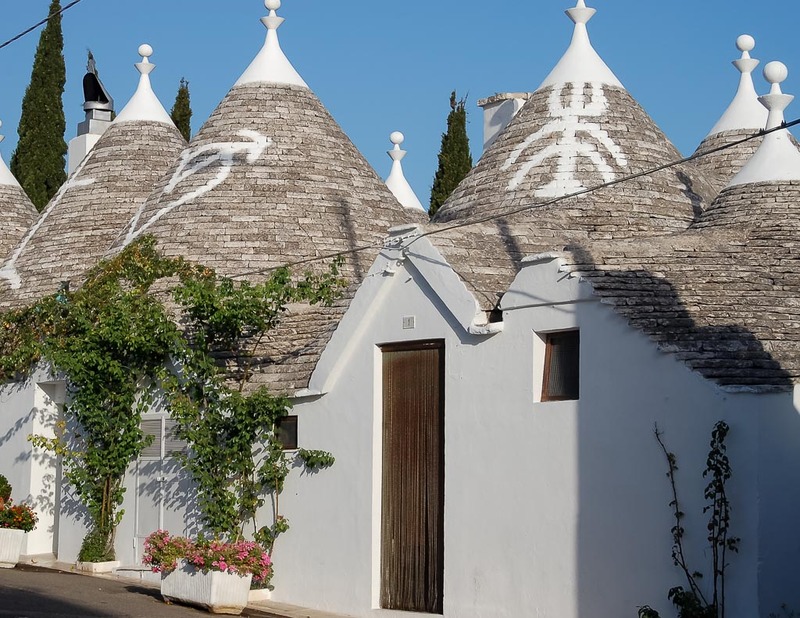 Trulli are round stone cones, originally made without cement, which may or may not be attached to buildings. They relied on a stone “plug” at the top of the cone to support the tension of the cone. Pull the plug, and the cone imploded. This was done whenever Federal government tax inspectors appeared to levy taxes on buildings. All they would find was a pile of rubble that was miraculously restored to a trulli as soon as they had passed! The university town of Lecce is as magnificent as Florence, but much less well known. Full of character, but a working town, not just for tourists. 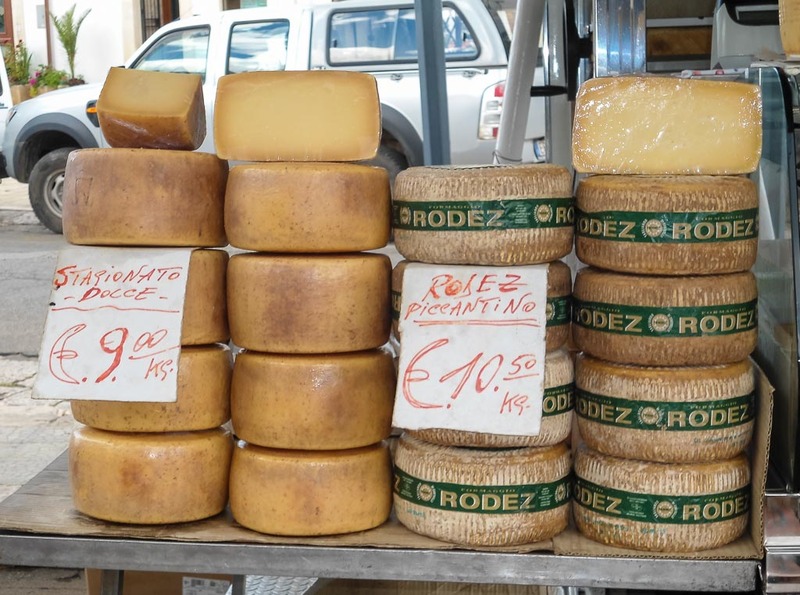 Lecce and many smaller towns have large outdoor markets that are fun just for wandering around. A big activity is… just sitting at a coffee shop or ice cream shop and watching the world go by! Each evening the Italians have “Il parade”, when everyone just goes up and down the street to see and be seen. The same people will often pass back and forth in front of you six times and they aren’t actually going anywhere! Alberobello itself needs at least a day to visit the many different types of trulli and "museums" (as tourism isn't very developed many places of attraction are just a €2 charge to look around inside a trulli). The town is compact, no more than a couple of square miles across, and there are maps on some street corners showing the best sites to visit. During the lunchtime break, you can retire to the trulli then go back to town for an evening stroll and dinner. 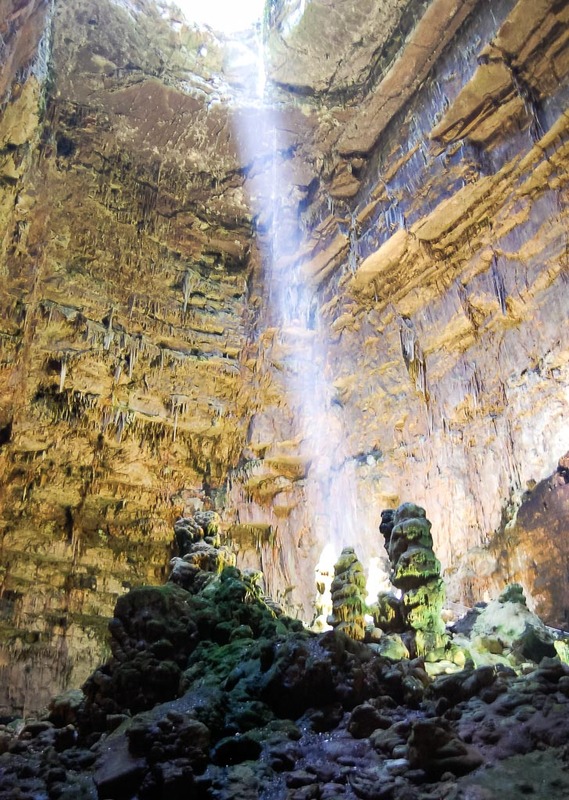 Experience the "Grotte di Castellana". These are famous and extensive caves about a 30 minute drive away, with spectacular stalactites and stalagmites. You are only allowed to go round in conducted tours that take place every 30 minutes. There are some tours in English, but we went on an Italian one and although none of us speak Italian it was perfectly good enough. The village of Castellana itself is a bit dull apart from a church full of sculptures and paintings. We had lunch in one of the restaurants right by the caves. These may look very touristy, but the food was excellent and reasonably priced. This is a small town only 10-15 minutes drive away. There is a small "Centro storico" (historic centre) that is well worth a couple of hours to meander, some of the views can't have changed for 500 years. Later, several restaurants offer excelent Puglian dinners. Otherwise known as "the White City" and about 30 minutes drive from the trulli. Here even the pavements and roads in the centre are white. The 15th century cathedral (built in 1435) is impressive even by local standards. Nearby S. Maria la Nova has beautiful frescos, but at least half the fun is just wandering around the streets, with unusual buildings and corner structures at every turn. I have wandered into at least 8 churches, all very different from each other, enticed by the beauty of the street facade. There are lots of interesting shops, often selling strange things (some seem to sell only what looks like witches' broomsticks!). Make sure you look over the eastern ramparts towards the sea about 8 miles away. It is slightly unnerving as there is a sheer drop of several hundred feet in places, but the view across the olive groves and vineyards is glorious. 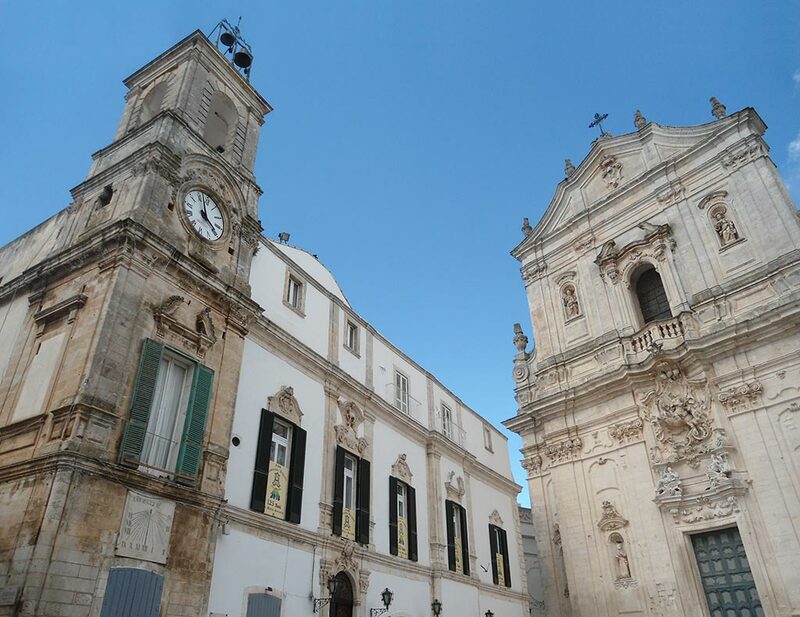 Ostuni is more touristy than many of the other towns, it is bigger and has more interesting buildings. Inevitably it attracts crowds, but the town is still well worth a visit and takes until siesta time or beyond to explore properly. An absolute must. 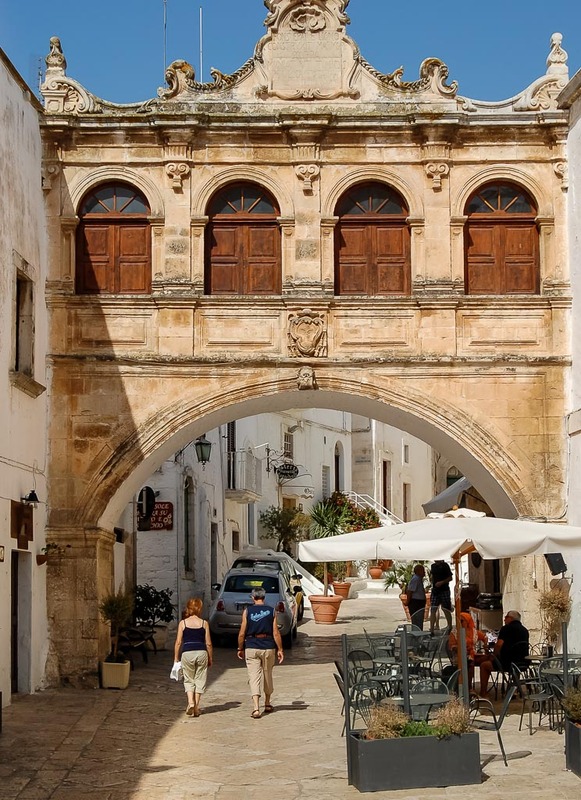 A couple of hours drive from the trulli will bring you to into a town rich with rococo style architecture. 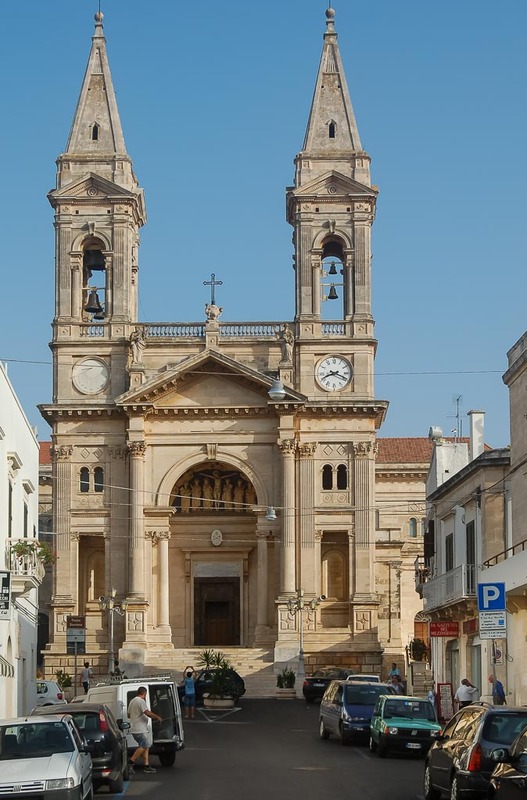 Had Lecce been situated in the rich and accessible north, we are convinced Lecce would be as famous as Florence. Lecce never had the power or influence of Florence, but once it was very wealthy, and this is reflected in endless ornate buildings, too many to mention. Again the only tactic is to park the car on the edge of the central area and walk about. By the end of the morning your reaction will be: "Oh no, not another priceless medieval spectacular building, let's go for lunch!". There is a market on Sundays and although it is mainly for the locals there is plenty of interest, definitely worth a visit. There are also several Roman ruins dotted about the place, often not even signposted. We stumbled across an amphitheatre that would attract visitors from miles away in the UK, but here it just passes unnoticed in a quiet corner of town. Especially if you have kids who may have overdosed on architecture by now. 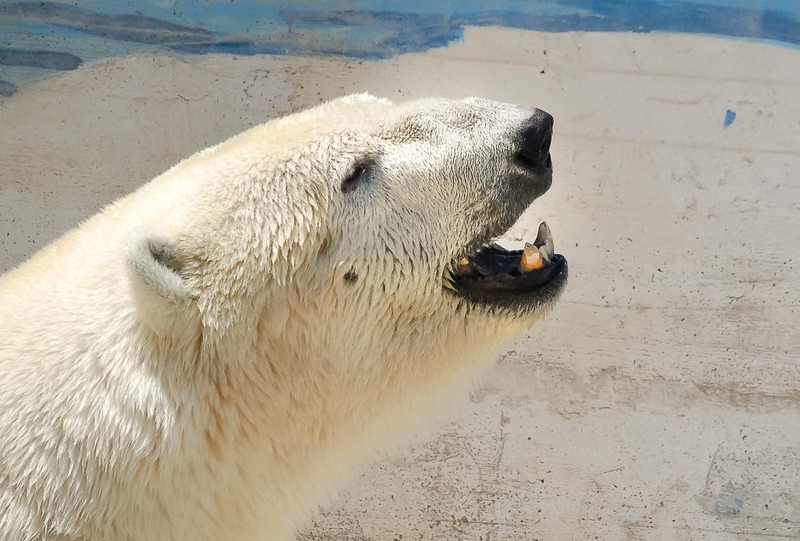 What about Fasano wildlife safari park? On the day we went it was very crowded and not very different from an English safari park. We recommend you go either early or late. Between 11.00 and 14.00 it was chaos, but we were there in August, easily the busiest time of the year. The park did have a spectacular range of animals that it was possible to get very close to. The setting and vegetation is a lot closer to Africa than UK safari parks, and it was good fun to go around; however it was the most "mass attraction" place that we came across, so if you don’t want crowds, don’t go there. At about 30 minutes from the trulli, Fasano itself is a pleasant small town, but not very exciting. If you are feeling a little adventurous, then don't follow the official signs taking you via Locorotondo. Instead turn right off the S172 about 1 mile outside Alberobello onto the P58. The only signposting is to "Green Park Agriturismo" – no road sign or an indication that this is in fact the old road to Martina Franca. Just keep following the signs to Green Park and when a turn off is indicated, just stay on the road. By then you will see Martina Franca in the distance. This route goes right through the middle of Valle d'Itrea, the heart of trulli country. You are surrounded by trulli of all shapes and descriptions on every side. It's a fascinating drive. Martina Franca itself looks pretty unappealing from the outskirts, just a bunch of 1970s flats. Don't let that put you off. The cobbled street centre has an area of highly atmospheric buildings and interesting shops. There seems to be a lot of wealth in Martina: Hidden amongst streets that often look very ordinary will be super-smart Italian designer furniture or antiques shops. There are also lots of good restaurants for dinner. 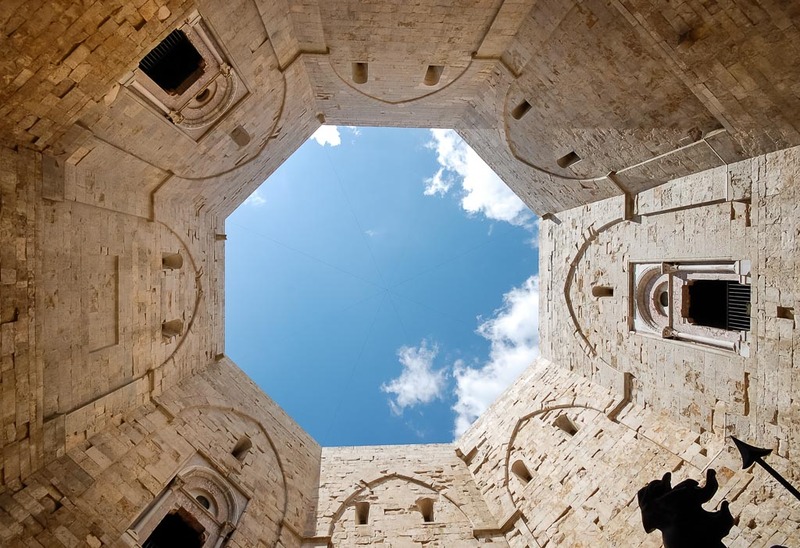 Castel del Monte, is fascinating. It is about 90 minutes north of the trulli. Do park in the car park at the bottom of the hill for about €5-10 and take the bus the rest of the way up the hill. There is no parking at the castle itself and it is a long, hot walk up the hill. The car park fee includes the free bus shuttle and is per car, not per person, so it's actually quite a bargain. It is one of the most famous sites in Puglia. It is thought to have been built by Fredrick II after his return from the Crusades. The shape is a mathematically exact Octagon with eight octagonal towers around the central octagon. There is a huge amount of mythology around the castle which has yet to be solved. It is located half way between the cathedral of Chartres and Cheope's pyramid and is believed to have been designed to reveal a secret to those who know what they are looking for, but no one knows what or if they do they are not saying. Another legend claims that the shape was designed to concentrate great magical power rather like mirrors concentrate the sun's rays in one spot in a modern solar power station. The castle was built in such a way that its shadows exactly match the signs of the zodiac. The truth is that very little is known about the castle, and it was neglected for many years. It is one of the strangest and most inspiring medieval structures we have ever come across. We came back via the beautiful and ancient port of Trani, a great place to have a meal or just an ice cream by the harbour. About an hour's drive away. 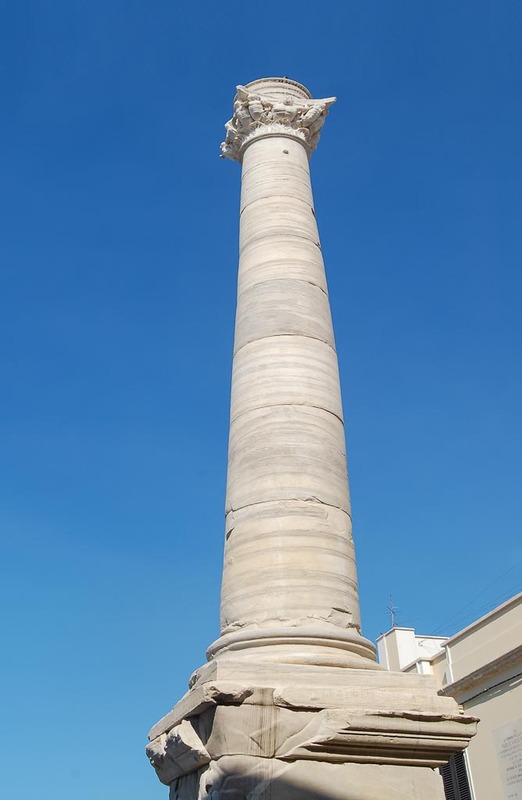 Brindisi is no great tourist attraction, although not for want of trying. Only one of the churches was unlocked when we went there. The columns marking the very end of the Appian way were worth seeing. There is a lovely harbour and castle with old city walls. I liked the atmosphere of a small Italian town with a couple of nice shopping streets, the rest of the family thought it a bit dull, as it is just an ordinary Italian town, but that can be quite fun too. If you do visit, there is a café / ice cream shop called Skippers just beyond the Appian Way columns by the harbour front that sells truly spectacular ice cream even by Italian standards. The historic centre includes a couple of beautiful churches and the main shopping street is quite something. Forget all the stories of the "poor south", looks and fashion matter to Italians big time. Every expensive designer brand you have ever heard of seems to have a large branch – in an Italian provincial town! 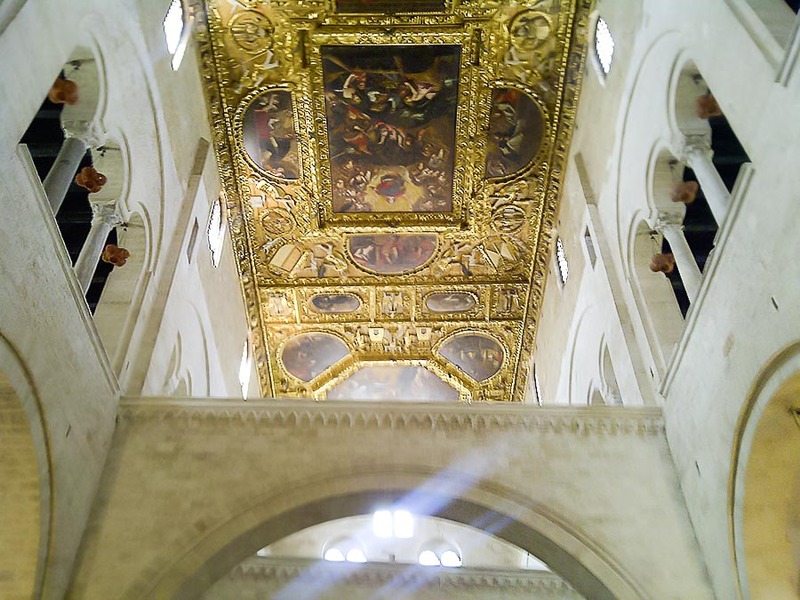 There are areas of Bari that may be best avoided at night, like any major city, but the centre is a delightful bustling town, albeit complete with Italian driving chaos! 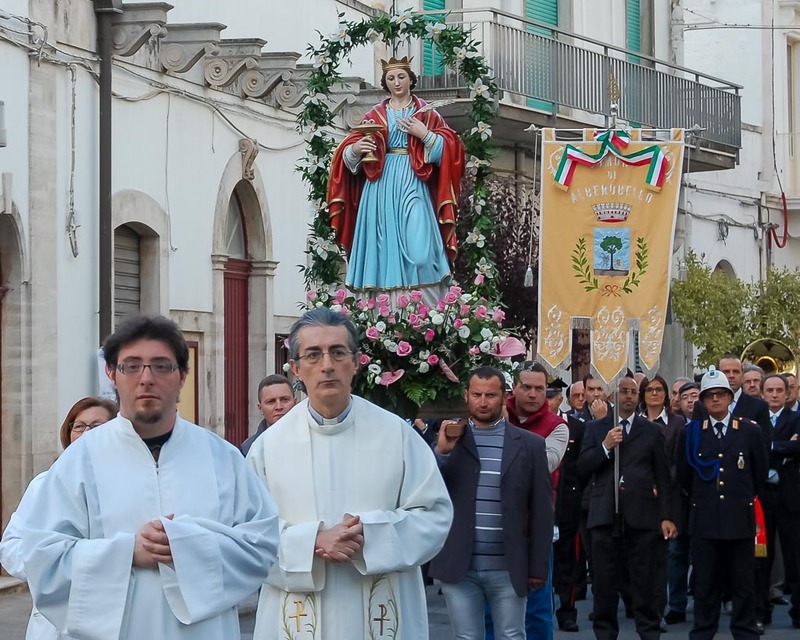 Not mentioned in any of the local guidebooks because it isn't in Puglia, but in neighbouring Basilicata. In fact it is just over one hours drive and well worth the journey. 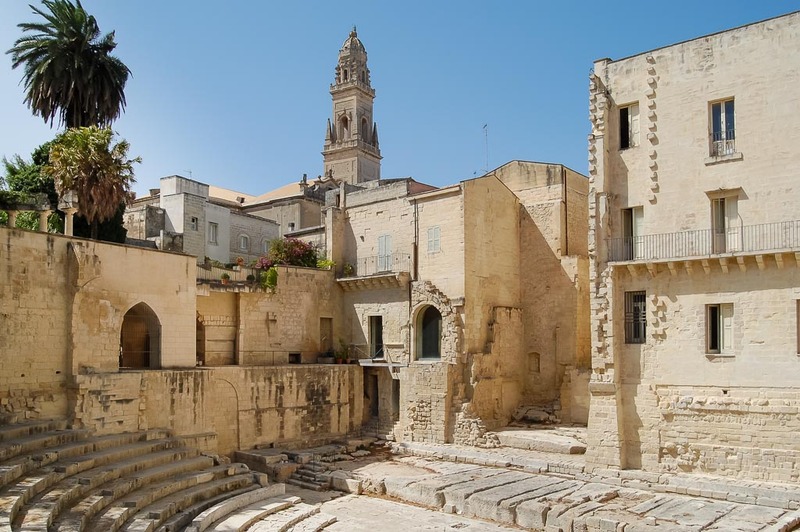 A UNESCO World Heritage site, Matera has been used as the film set for around 14 films including Mel Gibson’s controversial film 'The Passion of The Christ' and the cult film 'Christ Stopped at Eboli'. 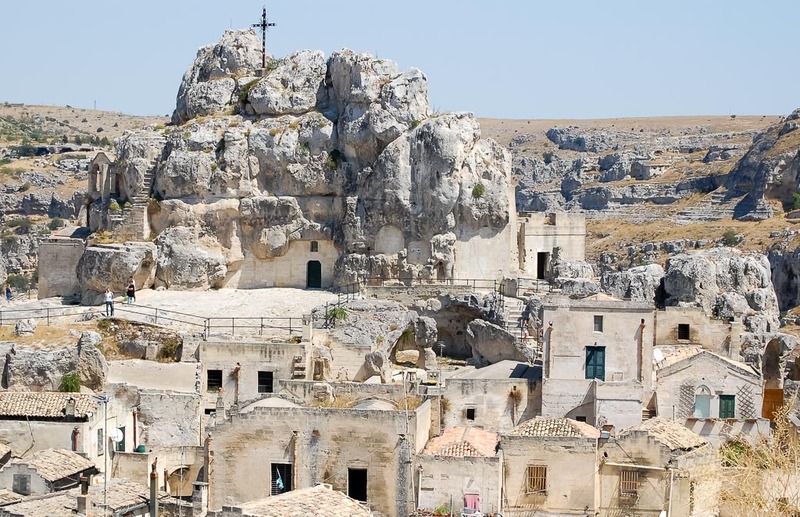 Matera is famous for its cave dwellings, where residents lived in caves with their animals, incredibly, until the 1950s until the then Prime Minister was so horrified at what he saw in terms of poverty and medieval living conditions that he ordered an immediate clearout. One of the very poorest corners of Italy, it remained almost unchanged for centuries until it was turned into a national monument. The resemblance to the popular image of biblical Jerusalem has made it, and continues to make it, a magnet for filmmakers. Frescos hundred of years old have survived in the cave churches in astonishing condition.